How do I export grades in the New Gradebook? You can export scores from the Gradebook and download them to your computer as a CSV file. Some columns that appear in the CSV file are read-only columns calculated by rules or percentages set in Canvas. Any changes made to these columns will be ignored when you re-upload the file to your course. When a grading period filter is applied in the New Gradebook, the export displays the filtered grading period results. For assignment group columns, changes made to assignment scores will automatically be included in the assignment group calculation in the Gradebook. The Total Score displayed in the Gradebook reflects each student's score at the time of viewing, taking into account whether the instructor has muted assignments, assignment due dates, etc. The CSV download includes read-only columns for current and final scores. Current score reflects the total while ignoring unsubmitted assignments, and the final score counts unsubmitted assignments as zero. Muted assignments are unposted grades and shown in separate columns for unposted current score and unposted final score, respectively. If a student has submitted an assignment multiple times, the CSV file only accounts for the most recent submission. Concluded and inactive enrollments are not included in the CSV file unless their respective option, Show Concluded Enrollments or Show Inactive Enrollments, is enabled in the Gradebook Settings menu. Complete/incomplete assignments are shown as full or no credit (e.g. for a 10-point assignment, 10 or 0). If you have the Final Grade Override option enabled in your course, the Gradebook export will include the override grade. However, overriden grades cannot be changed through a Gradebook import. Click the Actions menu , then click the Export link . When the export is completed, Canvas will download the CSV file automatically to your computer. If you navigate away from the page during the export, the CSV file will appear as a previous download in the Actions menu so it can be downloaded again. 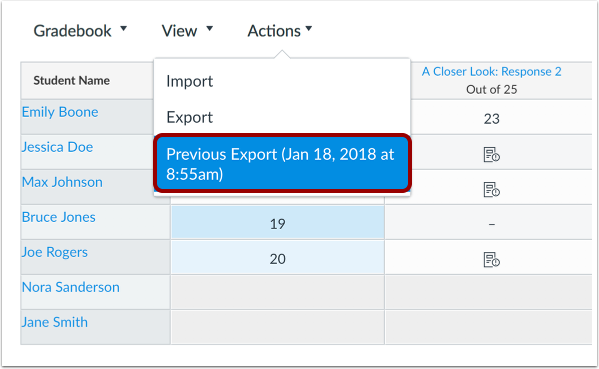 The Gradebook will show the date and time you requested the export. If you made changes to the Gradebook after exporting a file and want to export a new file, click the Export link again. Note: Gradebook export files include the date and time of the download to differentiate between multiple exports. The export filename format is YYYY-MM-DDTHHMM, followed by the course name. Edit the scores in Microsoft Excel. Make sure to save the file as a CSV file type. Once you have made changes, you can upload it to your course. The CSV download includes read-only columns displaying current and final scores. These columns display for each assignment group in a course and for final course grades. Previous Topic:How do I view a student's Grades page in a course from the New Gradebook? 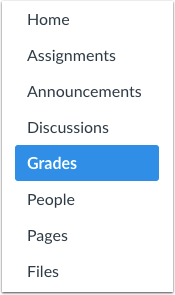 Next Topic:How do I sync grades to Banner in the New Gradebook? 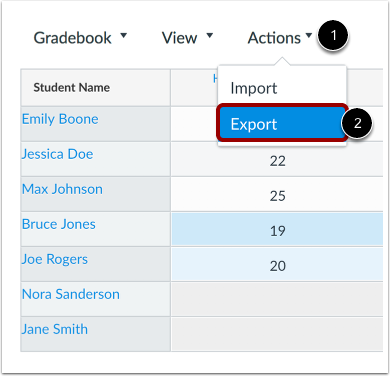 Table of Contents > New Gradebook > How do I export grades in the New Gradebook? Re: How can you download "All" student's test results at one time?